Life Candy: witch. doctor. which doctor? doctor who. yeah. witch. doctor. which doctor? doctor who. yeah. My kids ADORE Halloween. Yes, the prospect of acquiring massive loads of candies are a big motivator, but I think they love the "dressing up" part more. They get to show their coolness and creativity, choosing off-beat characters that you don't often find in the racks of them big box stores. 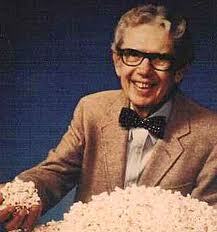 Lam declared from the very beginning that wanted to dress as his favourite peace-loving alien saviour of worlds. No, not Superman -- I'm talking about The Doctor! 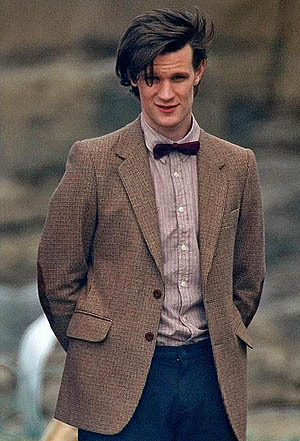 The 11th Doctor, to be exact. So we gathered up a suit jacket and bow tie (from a 2nd hand store), suspenders (from Roomie's collection of childhood clothes), psychic paper (Mommy's old wallet), and of course, THE BELOVED sonic screwdriver, ordered from ThinkGeek. 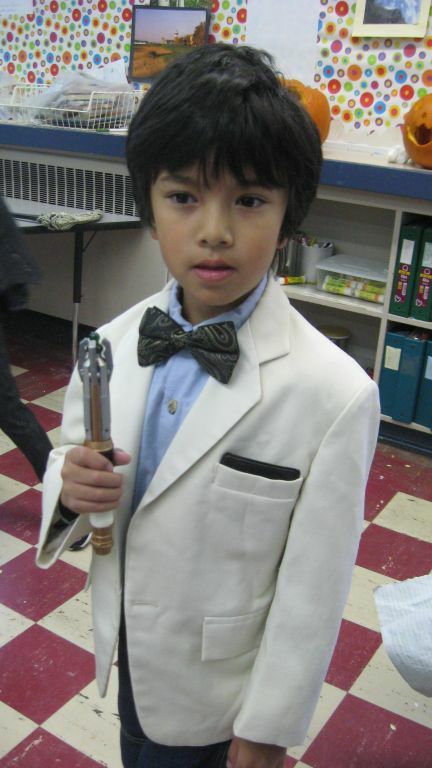 The kids wore their costumes to school today for their Halloween party, but with the school's policy of "no costume weapons", Lam wanted me to talk to his teach to make sure his sonic screwdriver -- the peaceful tool The Doctor uses to accomplish his good deeds -- didn't get confiscated. Because if it did, he wouldn't be The Doctor. He'd be just a dude in a suit. All went well, and he spent all afternoon with his beloved toy in hand. 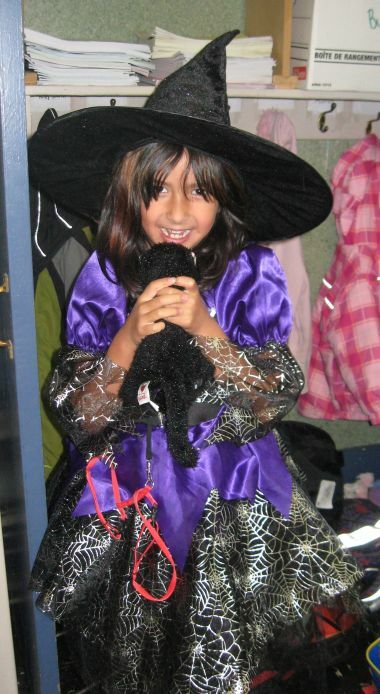 Mini, on the otherhand, made my life easy with her wickedly adorable witch costume that she fell in love with during a trip to Zeller's with Roomie. She just added her black cat stuffie named Lala, et voila! There were about 4 other witches in her classroom, but she was the only one with a mysterious black cat. Which is, you know, the Most. Awesome. Thing. Ever! Mini gets to wear her costume at her dance class on Saturday the 30th and of course for trick-or-treating on Sunday the 31. Lots of mileage, so yay! Yeah, we're ready. Are you? Also a man with a very good Tenth Doctor costume. But what's with the "no costume weapons" policy? Are your kids going to a school in the north end where someone might actually bring a real weapon? Does the school have a history of kids being injured by cardboard pirate cutlasses? Are the kids made out of paper? How the hell can you be a Viking or a knight without your cardboard sword? Or a caveman without your club? Of course boys want to dress up as things that carry weapons, that's what boys do. And, we're home sapiens - our biggest weapon against all the animals that want to outcompete us for resources is our brain, not our teeth or our claws - so no costume brains in school either!